Albeit the threat to language is not as literal in The Word Exchange as in Bradbury’s enduring classic Fahrenheit 451, I thought it was horrifyingly appropriate that it was a fire that inspired Alena Graedon to write this complex story in the first place. A house fire in university destroyed her personal library and with it the gift of a dictionary from her parents, reflecting on it afterward she wondered “what would happen if one of the entries simply disappeared?” Like most of us, Graedon explained that she was rather ambivalent about digital media before the fire. The incident underscored the anxieties most of us have about the security of our print collections, however with print typically there are backup copies available. The Word Exchange explores the possibilities of what would happen if there WAS no backup. In the not so distant future, the forecasted “death of print” has become a reality. Bookstores, libraries, newspapers and magazines are a thing of the past, as we spend our time glued to handheld devices called Memes that not only keep us in constant communication, but have become so intuitive as to hail us cabs before we leave our offices, order take out at the first growl of a hungry stomach, and even create and sell language itself in a marketplace called The Word Exchange. Anana Johnson works with her father Doug at the North American Dictionary of the English Language (NADEL), where Doug is hard at work on the final edition that will ever be printed. Doug is a staunchly anti-Meme, anti-tech intellectual who fondly remembers the days when people used email (everything now is text or video-conference) to communicate–or even actually spoke to one another for that matter. One evening, Doug disappears from the NADEL offices leaving a single written clue: ALICE. It’s a code word he and Anana devised to signal if one of them ever fell into harm’s way. And thus begins Anana’s journey down the proverbial rabbit hole. . . In the six short years that it took Graedon to write The Word Exchange, abstract concepts similar to her MEME, like wearable technology have crossed the divide from science fiction to reality. Nowadays, we can sync our phones to our cars in a few easy steps, I know this for a fact because my husband who really is one of the least tech savvy men I know did it and now shameless brags about his vehicle reading his texts aloud to him as he drives. Webopedia defined wearable computing as a term that refers to computer-powered devices or equipment that can be worn by a user, including clothing, watches, glasses, shoes and similar items. Wearable computing devices can range from providing very specific, limited features like heart rate monitoring and pedometer capabilities to advanced “smart” functions and features similar to those a smartphone or smartwatch offers. Alena kindly took the time to talk about The Word Exchange and the implications of our increasingly technology dependent society. While I was at times alarmed having a tendency toward hysteria like the birds in Chicken Run, Alena was more prosaic about this inevitability and here are some of her thoughts. 1. What were the challenges (research, literary, psychological, and logistical) in bringing The Word Exchange to life? For so much of the life of this book, I never knew if it would find readers, and writing into a void can be tough, both psychologically and logistically. It’s hard to sacrifice rare free minutes to something that may never really exist when you want to devote them to things that do: work, family, friends. But writing that way, when no one expects anything of you, is also very liberating. There’s no reason not to risk things. One risk that I took was to use language that might potentially be a little alienating for some readers. My hope was that I could offer a hint of the alienation that the book’s characters experience when they encounter word flu—to give at least some semblance of the experience of what it might feel like for words to lose their meanings. And that was quite tricky, using language as its own most powerful tool for demonstrating the significance of its loss. It was very hard to find a balance between trying to suggest this estrangement without actually estranging. I don’t know if I managed to strike it perfectly, but I did work at it. That was a challenge. As for research, that part was really a pleasure (and maybe a secret form of procrastination). I did a few different kinds: interviews—with lexicographers, a few really brilliant scientists (a neuroscientist, a cancer geneticist, and a software engineer, among others), a Hegel scholar, and an urban spelunker. I also did site visits, including to the offices of the Oxford English Dictionary in both Oxford and New York. And of course I read a lot, all kinds of things. From books on lexicography and pneumatic tubes and cyber warfare to articles on biological computing and machine-human interfaces. I reread A Clockwork Orange, which also plays with language; Flowers for Algernon, which offers a brilliant model of cognitive decline; The Man Who Mistook His Wife for a Hat, which is a collection of case studies of different neurological disorders; Alice in Wonderland, of course; and all sorts of novels: ones with multiple narrators, ones with large casts of characters, and everything in between. 2. How do you feel as a logophile about the question, “What is the genre of your book?” Are there too many words? Too few? I grew up reading science fiction and fantasy, which I still love, but I soon started reading lots of other things, too: mystery novels, things in translation, poetry, giant 19th century classics. My interests are all over the place, and I’m sure that’s strongly informed my own writing. Fortunately, lots of my favorite books—fiction, nonfiction, poetry, too—don’t seem to slot neatly into categories, which has given me a certain solace and sense of freedom. I’ve always felt like it’s okay to write the kind of book that you want to write. And again, I think that writing without a net—and therefore also without thinking too much about anyone’s expectations of what the book was supposed to be—made that easier. 3. I would imagine that most readers will have to look up a word or two in the course of reading your novel. Now that the book is out, do you find that people are a little more aware or cautious of their word choices around you? I don’t think so. I hope not. Maybe it’s lucky that I’m really pretty inarticulate. I hope that puts other people at ease. 4. Your book has been described as a cautionary tale on the cultural implications of digital technology. Do you agree with that description? If so, in what specific ways should we, as a society exercise caution? I’m not sure that I’d describe it as a cautionary tale. More than anything, I hoped that it would be an entertaining story. But it would be coy of me to say that there isn’t any sort of message. I know that fiction writers aren’t supposed to take any sort of stance in their work, but of course we all do, whether we’re conscious of it or not. I will say that writing this book didn’t make me afraid of technology. I depend on the Internet and digital devices, and I’m incredibly grateful for the many innovations that technology has made possible, especially with medicine. I became much more aware of various technological advances while researching The Word Exchange. But I also became more aware of what we could lose if we depend on devices too much. And I’ve been wary of some of the ways in which I’ve noticed myself changing as I rely more and more on all these lovely little blinking devices. I’ve felt that my capacity for reflection and creativity seems to be eroding, and that maybe my ability to focus and remember and maintain attention has also been softening. And I’ve felt, too, that some of my relationships have suffered from all the mediation, and from our diminishing inability to weather silence and boredom together. Then there’s the fact, too, that there are only so many hours in a day, and if we’re all spending them watching cat videos and scrolling endlessly through Tweets, that means we’re not doing other things. I don’t think any of these things are inherently bad. I also don’t think there’s any turning back. But my hope is that the book might help add to the wider cultural conversation about how technology has intruded into our lives, and perhaps even get people to reflect on the ways in which we want the process to unfold, because we do have some control over it. It doesn’t have to be a passive process. We have choices to make. That’s one of the advantages of being humans and not machines. 5. In your TNB self-interview of The Word Exchange you write of the hope to both entertain and make people think. Do you believe it is possible to do both for the majority of readers? I definitely think that it’s possible. That doesn’t mean that I’ve managed it. But plenty of writers do, and I think that all good writing does manage to do both. We all like to be entertained—there’s nothing wrong with that. But for me, anyway, reading isn’t a very entertaining process if it doesn’t make me think, too. A novel is called a novel because it’s meant to show us something new about human experience. But we only recognize things as new—and as human experiences—if we’re asked to measure them against our own understandings of reality. In other words, to think. 6. There is a trend in book reviews that are heavily dependent on the use of animated gifs considering your story is about the threat to language how do you feel about those as a form of expression rather than using words to convey a message? 7. If you had to do it all over again, would you change anything in The Word Exchange? Probably, yes. Writing a book is such an iterative process—you’re sort of writing your way through the story, discovering it as you go. With this book in particular, as it was my first one, I was sort of learning how to write a novel as I was going along, too. And in revision, there were certain sections that I felt fine rewriting entirely, but others that I thought of as necessary anchor points, that I wasn’t willing to pull up. I think I worried that if I did, the whole thing might come unmoored. Now I’m not sure. I think that it’s easier to imagine letting even more go during the drafting process in the future, rewriting everything, which would naturally make things more streamlined. If you already know the story when you sit down to write a second draft, then you can tell it in a much more efficient way. 8. If you could have any one person living or dead read your book and love it, who would it be? Why? I’m just grateful for all the living people who have read it! I don’t know how to improve on that. 9. Which writers inspire you? I’m writing a few short stories, so that’s also the form I’ve been reading. I’ve been rereading Alice Munro. Right now The Runaway. I’ve also been reading Claire Vaye Watkins’s Battleborn, Ben Marcus’s new collection Leaving the Sea, Karen Russell’s Vampires in the Lemon Grove, Annie Proulx’s Close Range, and I just read a wonderful collection called I Am An Executioner by Rajesh Parameswaran. 10. What are you currently working on? Is it a departure from The Word Exchange? Before my husband, I had one great love. A love that strangely enough defined me in many ways, I was twelve. I know every love when you are twelve feels epic, and in retrospect I know that we were not Cathy and Heathcliff by any means but that doesn’t diminish the impact that this relationship had on the person I am today. I don’t remember precisely how our conversation began on that fateful day but when he looked at me and said “you are extremely loquacious,” it resonated. At the time I had no idea what it meant and when I asked him, like all twelve year old boys he lied about the definition but it was clear that he indeed knew what it meant. It could be said that my love of words sprang from this innocuous exchange. 1. tending to talk a great deal; talkative. When I came across the synopsis for The Word Exchange I knew that I had to read it. Prior to the above exchange I was already a book lover but as every girl knows there is not much that we will not to do to impress a boy. It was not a great leap to realize that I needed to be smart to nab someone who in casual conversation tossed out verbal salvos like the above. I will not sport with your sensibilities describing the lengths that I went to, to catch my quarry but suffice it to say that it is not surprising that after two libraries I ended up working in the media industry, specifically newspapers. Not only as a book lover but as a professional the implied threat to print media has real and tangible significance to me. In the not-so-distant future, the forecasted “death of print” has become a reality. Bookstores, libraries, newspapers, and magazines are things of the past, and we spend our time glued to handheld devices called Memes that not only keep us in constant communication but also have become so intuitive that they hail us cabs before we leave our offices, order takeout at the first growl of a hungry stomach, and even create and sell language itself in a marketplace called the Word Exchange. Anana Johnson works with her father, Doug, at the North American Dictionary of the English Language (NADEL), where Doug is hard at work on the last edition that will ever be printed. Doug is a staunchly anti-Meme, anti-tech intellectual who fondly remembers the days when people used email (everything now is text or videoconference) to communicate—or even actually spoke to one another, for that matter. One evening, Doug disappears from the NADEL offices, leaving a single written clue: ALICE. It’s a code word he devised to signal if he ever fell into harm’s way. And thus begins Anana’s journey down the proverbial rabbit hole . . . Joined by Bart, her bookish NADEL colleague, Anana’s search for Doug will take her into dark basements and subterranean passageways; the stacks and reading rooms of the Mercantile Library; and secret meetings of the underground resistance, the Diachronic Society. As Anana penetrates the mystery of her father’s disappearance and a pandemic of decaying language called “word flu” spreads, The Word Exchange becomes a cautionary tale that is at once a technological thriller and a meditation on the high cultural costs of digital technology. 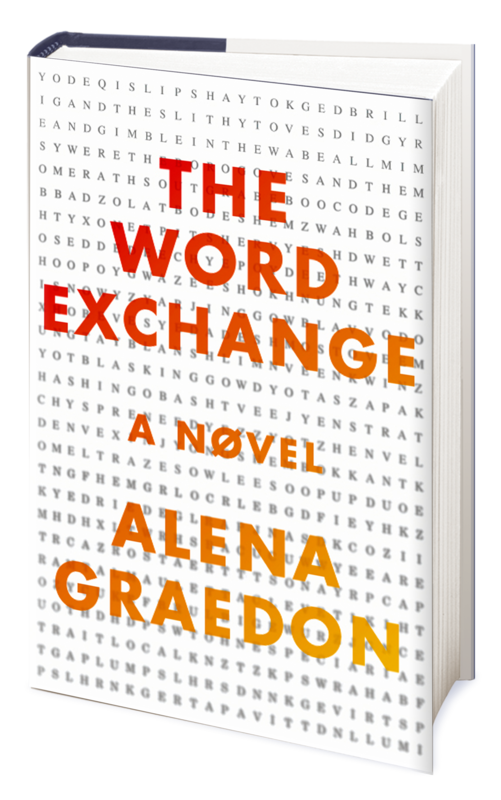 The Word Exchange is quite literally a smart book, written by an even smarter woman with whom I had the great privilege of discussing this Orwellian type tale. After I stopped hyperventilating over the prospect of having to actually speak to someone without the dubious protection of email or other electronic means I embraced the opportunity to find out a bit more about Anana, the Word Exchange, the diachronic society and anything else that may have occurred to me, I will detail the results of that fascinating conversation in The Word Exchange – Alena Graedon (Part 2). 1. of or pertaining to the changes in a linguistic system between successive points in time; historical: diachronic analysis. I found The Word Exchange to be a tense, entirely too plausible exploration of the threat to language which had me looking askance at my beloved iPhone particularly when I discovered the beautifully narrated audio version. This may not seem outwardly problematic until you actually read, or listen to in my case, the story. In the not to distant future almost everyone is in possession of a Meme, a device that takes care of all the little details and more than a few larger tasks in life, like hailing a cab, ordering a meal, streaming limns in place of reading books to name a just a few. Following a devastating breakup with her lover Anana had been spending a lot of her time with her father Doug. Without warning he misses their regularly scheduled dinner date and Anana is at first unconcerned, Doug being the absent minded scholar type but when she searches him out at his office in the Word Exchange where they both are employed she comes across a trail that is at first perplexing and then increasingly alarming as time passes with no sign of her father. Assisted by co-worker and friend Bart she is determined to locate Doug. A journey so bizarre it is not unlike Alice’s trip down the infamous rabbit hole. Coincidentally or so it may seem an insidious affliction is spreading, flu like symptoms of varying severity accompanied by aphasia. This malady in its most extreme form proves fatal but what if anything does it have to do with The Word Exchange or by extension her father. 1. the loss of a previously held ability to speak or understand spoken or written language, due to disease or injury of the brain. Through bread crumb like clues Anana learns that Doug may have had some inkling of the spread of “Word Flu” as it comes to be called and becomes even more desperate to find him. A glorious combination of mystery, love story and societal commentary Graedon in The Word Exchange has uncannily highlighted a possible outcome of our fascination and growing dependence on technology. I cannot recommend it highly enough, only keep your dictionary or “Meme” on hand to give you the definitions of some of the truly impressive examples of vocabulary used throughout. Technology is changing how we read, write and reason, as a growing number of critics suggest. Television has long been accused of making us stupid, but now the Internet, though overflowing with text, is also blamed. In an essay in The Atlantic last year, the technology writer Nicholas Carr argued that the power-skimming, link-hopping and window-toggling that define the Internet experience have eroded the old practice of reading unbroken stretches of prose, with grave implications for our writing.